Lovely specimens – these ‘Connover’s Colossal’ certainly live up to their billing. I was faced with a dilemma this weekend. 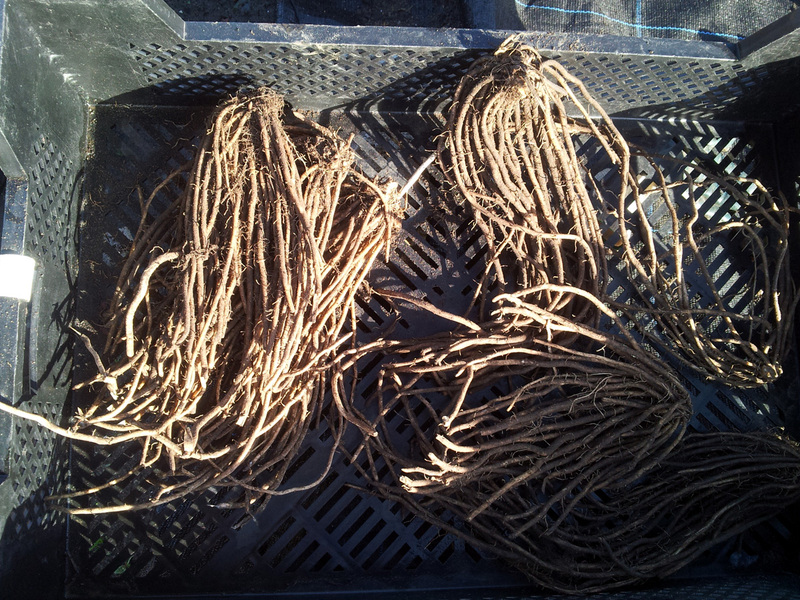 My order of asparagus crowns arrived from Blackmoor Nurseries on Wednesday. With a run of poor weather up to that point, and more rain forecast, I wasn’t sure whether to plant the crowns and hope they didn’t get too soggy, or keep them in their packaging and risk them drying out. After a word or tow of advice from my RHS course tutor on Friday (“get them in the ground,”) I ventured down to the plot yesterday morning to make my final preparations and finish the job. Nothing that a few minutes’ work with a rake can’t see right. However, walking between the rows made me realise just how claggy and wet (and therefore cold) the soil still was, so after a quick check of the afternoon’s forecast – bright spells until a light shower around 5.00 p.m. – I headed back home to give the ground a bit longer to drain. I took a soil sample with me and ran a pH test – which came in at a perfect 6.5, meaning I wasn’t going to have to add garden lime to the soil before planting – did the shopping, had lunch, and came back in the afternoon. 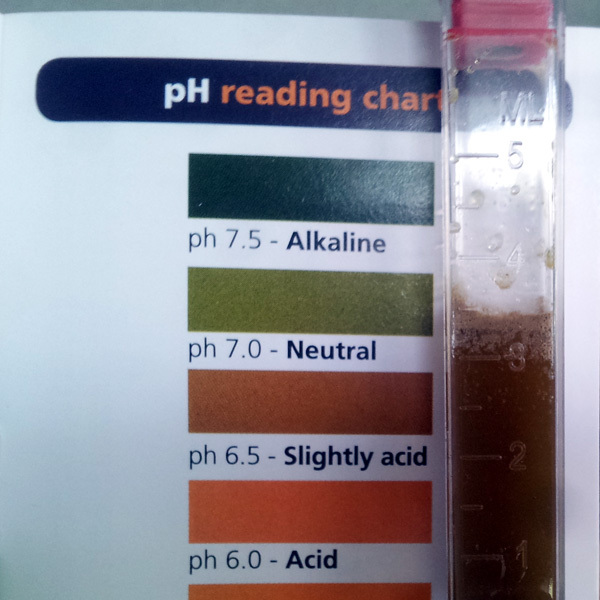 Not the best photo, but I think you’ll agree that’s a 6.5 result there? Those few extra hours of sunshine seemed to have done the trick. By 2.00 p.m. the ridges were looking much drier and had absorbed some warmth, although I still made a point of re-forking between the ridges to break up the thick pan that had formed as I’d been walking on it – the last thing we want is for water to accumulate between the ridges and rot the root tips as they grow – I also took the opportunity to fork in a bit more (extremely) well-rotted horse manure, just to give the plants an extra boost once their new roots reach that far. 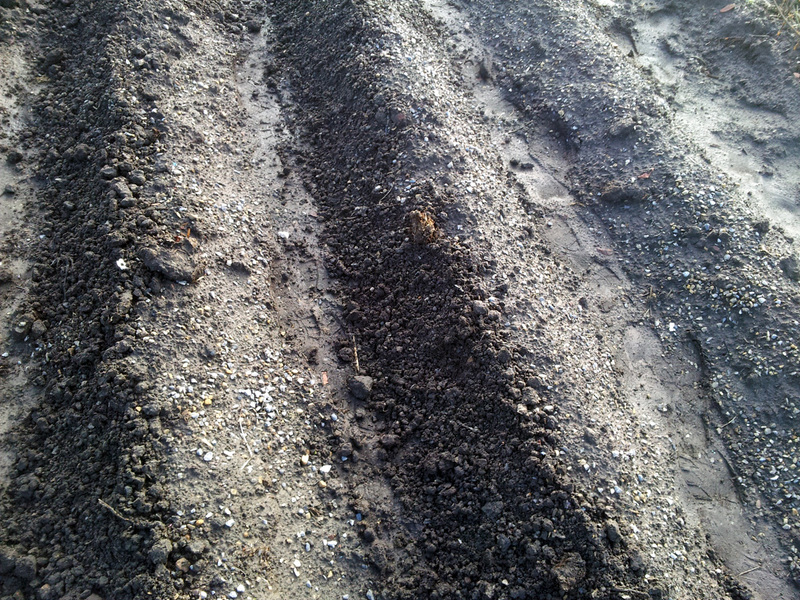 Then it was time to start planting. I’d ordered Blackmoor’s thirty crown pack of three varieties: Connover’s Colossal and Guelph Milennium are both RHS AGM varieties, and the latter is a later variety, which should extend the picking season from late April until late June. The third was Pacific Purple, which apparently has spears that are more tender, less fibrous and better tasting than pretty much anything else; time will tell, hopefully. The crowns were laid on top of the ridge, with their roots spread out in a fan to either side of the bud, roughly 30cm apart. 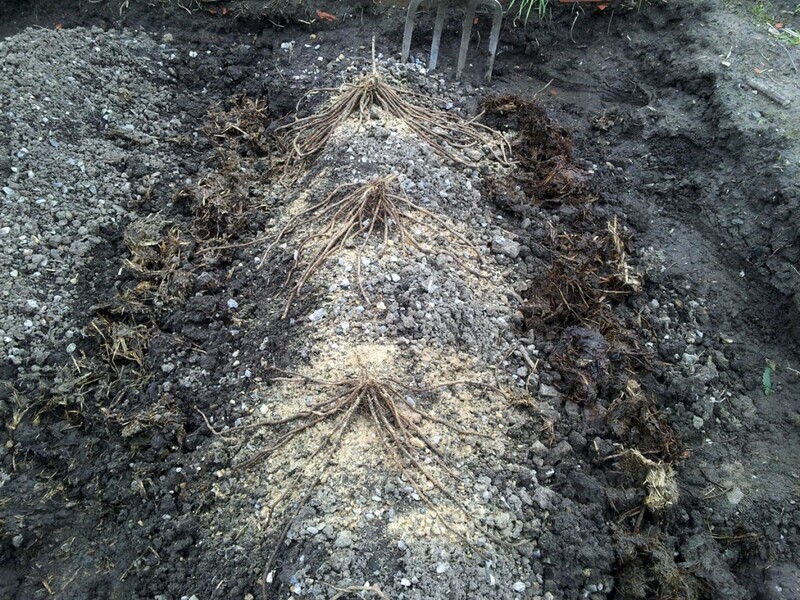 I then sprinkled on a bit of fish, blood and bone – a relatively phosphate-rich fertiliser, which should help the roots to develop in their first year – before shovelling soil over them, covering the roots, but leaving the bud-tips exposed, as advised in the instructions from Blackmoor. 30cm spacing, a sprinkle of FBB and we’re good to start back-filling. Bare ridge, ready for planting. Crowns in position, ready for back-filling. Back-filled ridge, with just bud-tips showing. By 4.15, with half a ridge left to finish off, the promised “light shower” arrived, except it turned out to be a moderate hail shower, followed by a burst of heavy rain. 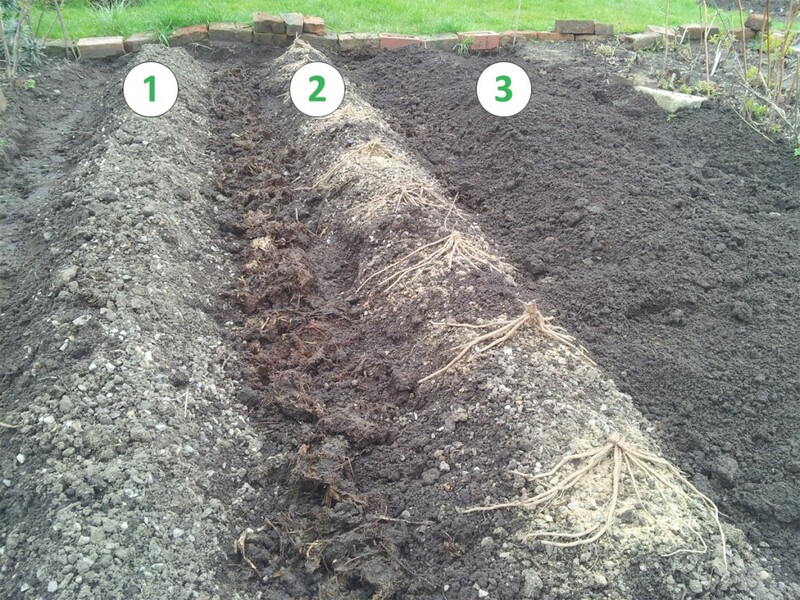 I finished the job off – what’s a little rain to an allotmenteer, eh? – and focused on the silver lining: nature was apparently going to lend a hand and water the rows in for me. I’ll be back down today though, to make sure the soil hasn’t settled too far and exposed any roots (I do hope not, as we had a light frost overnight) and will back-fill some more if necessary. And then: the waiting begins. First for those oh, so exciting signs of new growth this year, and then a full two seasons – it’s essential to allow the crowns time to properly establish and strengthen, rather like rhubarb – before we can pick our first harvest. That will be the true test of my patience, but I’ll just have to grit my teeth and bear it.